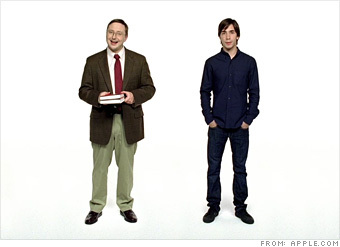 "People have finally started to realize that they don't have to put up with Windows," Jobs says. Apple's ad campaigns play up that idea. "It was difficult for a while because for various reasons the Mac had not been accepted by a lot of people, who went with Windows. And we were just working really hard, and our market share wasn't going up. It makes you wonder sometimes whether you're wrong. Maybe our stuff isn't better, although we thought it was. Or maybe people don't care, which is even more depressing. "It turns out with the iPod we kind of got out from that operating-system glass ceiling and it was great because [it showed that] Apple innovation, Apple engineering, Apple design did matter. The iPod captured 70% market share. I cannot tell you how important that was after so many years of laboring and seeing a 4% to 5% market share on the Mac. To see something like that happen with the iPod was a great shot in the arm for everybody."